Welcome back to another edition of Traffic Tuesday with ThreeMoneyMethods.com! I wanted to show you today in this video something I learned from James Martell, he’s a friend and a very smart marketer. One of the things he talked about was taking the images that you use for all of these different social networking sites you are a part of and actually putting a web address in them. And I thought that’s kind of an interesting idea, never tried it before, so I figured I’d give it a shot. I changed out mine on my personal Facebook page, I changed it out so that it included the URL CarrieandJonathan.com which is our site where we do all of our travel stuff. It worked here so I went and changed out my Twitter profile too; Twitter only allows you to have smaller images, but you can look at this close enough to see our domain name in the image there. So what I wanted to do is show you real quick how we did this. There’s a bunch of different free image creators online; I think you can just Google “free image creator” and you’d find a bunch. What I’m going to do is actually do it inside of Photoshop because I’m familiar with Photoshop. But if you don’t have Photoshop, just Google “free image creator;” and you should be able to create a little avatar or a custom logo here for yourself in a few different sizes. What we’re going to do is actually create it in five different sizes. I’m going to go “create a new image” here and we’re going to start off with it in 250 by 250 (pixels); most of these sites have square avatar images. Some of them have rectangles but the vast majority of them are in square image sizes, so we’re going to make the width and the height equal. We’ll go ahead and click “ok” here. So I now have my image; unfortunately it’s not fitting up with the box here, but you kind of get the idea. What we’re going to do is – maybe I’ll make it really simple and I would just put some text in here. We’re going to make one today for Three Money Methods. So I’m going to go ahead and put some text in here. You can see it’s overflowing the image there, so I’m going to have to make it smaller; so I’m just getting my formatting here all squared away. We’re going to make this just a little bigger. This really isn’t intended to be a Photoshop class; if you aren’t good at this, you can just hire somebody on Elance to create this kind of stuff for you. But it is a good skill to have and if you don’t have this kind of software, at least you’ll know what to do to have someone do this kind of work for you. We’re just going to go ahead and make this image – so I’m going to spare you most of the details of me creating this image because you can learn to do this on your own; this is really about traffic. I’m going to put it inside of my Three Money Methods folder here and we will call this “avatar-image-250-250.” I’m going to save this as a Photoshop file and then I’m going to save it again as a JPG because that’s the file type that most sites accept. Occasionally, you’ll run into somebody that accepts a GIF and not a JPG, a G-I-F file and not a J-P-G file, but for the most part, people just accept the JPG file more often. So we’re going to go ahead and save this as a JPG here – it doesn’t need to be ridiculously high quality, we’ll put it at 55 there and we’ll go ahead and save that. What I’m going to do is I’m going to resize this image; so instead of it being 250×250, it’s going to be 200×200. I just want to check it out and make sure everything is still pretty visible here – yes, looks good! So I’m going to go ahead and save this; by the way, this is the Facebook size, 200×200. So we’re going to save this as “avatar-image-200-200” and we’ll save it as a JPG. Then we’re going to go “image-image size” and I’m going to save it as 120×120, so we’ll have one that is that size. Now this is getting a little harder to see, but you can see it, so I’m not going to worry about changing the size of things here just yet, although we will as it gets smaller here. But we’ll go ahead and save this as “avatar-image-120-120” and we’ll save it as a JPG. The reason for all these different sizes is different websites will only accept different sizes of image avatars. For example, when I showed you Twitter over here, Twitter only accepts a relatively small file of 50×50; I think that’s the size that Twitter accepts. So in order to get yours down to that size and make it still visible, you have to make it 50×50 or 75×75 or 80×80; I’m not exactly sure what their avatar image size is. But we’ll go ahead and go “image-resize” – you just want a bunch of different sizes so that it works on a bunch of different websites for you. I’m going to go ahead and put this at 80×80 and now, it’s really too hard to see. Unfortunately, it’s just become too difficult to read really anything on here. So I’m going to try and clean it up a little bit so I can actually see the domain name down here for just this text. Just by turning off the drop shadow, it becomes much easier to read what it actually is, so I’m going to go ahead and click “ok.” That’s really good enough for me at this point, just for purposes of this video, we’re going to go ahead and say that that’s good enough. I’ll go ahead and go “file-save as” the 80×80 JPG. Then there is an option for a 50×50; I just don’t know, unless your domain name is like just 10 characters long or something how you get it to be readable in that size of an image. But we’re going to try here just for purposes of the video. I do, on the domain name, “3” Money Methods with a number 3 instead of a t-h-r-e-e; so that becomes easier to separate this out here and gives me a little more space, although it’s still going to be hard to read. So I’m going to go ahead and size this down so that it’s 50×50 and then we’ll see how we can make it more visible in that size range. So we’re going to go 50×50 and as you can see it becomes very difficult to see it at all; so we’re going to try to get it so we can see it, but I don’t really worry too much about it because with the 50×50 size there’s not much you can do to make it really legible. But you can see it just becomes really difficult to make it so it’s even legible at all at that size. So what I might do here is get rid of the “.com” on the end and that gives me a little more room to stretch this out, just a little bit; and I think that’s as good as its going to get. So we’ll just leave it like that: “3MoneyMethods.” And I’ll go ahead and do a “file-save as” and this will be our 50×50 image. The nice thing about doing this is that it’s just another way to bring traffic back to you because people actually see that image in your profile when they’re looking at your posts or your things that you’ve put on Facebook or Twitter or MySpace or wherever and you get another opportunity to “brand them” with your logo or your name in the actual image itself. We always have this saying, “A picture equals a thousand words;” well, here’s your picture! And now we have all these different files sizes that we can use. This is our original and then we’ve got this one that we made which is much smaller. We can post these now onto different profiles and get traffic that way having put an image with a URL in it. That’s just a quick little tip and again I got that from James Martell. There’s a link, if you’re on the Three Money Methods website, where you can go to actually learn more from James Martell. Just a great guy and a great affiliate marketer! You can definitely learn a lot from him. 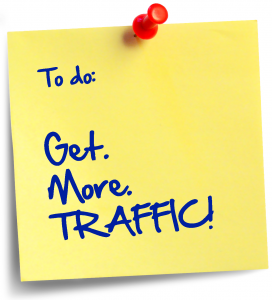 Hello and welcome back to another Three Money Methods Traffic Tuesdays! I’m your host Jonathan Kraft and today we’re going to be talking about ranking in Google Image Searches! We’ve talked about this briefly in the past, but we’re going to talk about simple ideas for how to get ranked in image searches. WebProNews recently had an article on this; I don’t think they went in depth enough to really explain step-by-step what to do – you probably should really read WebProNews, you get a lot of interesting stuff out of here. This is a big deal! We have that statement in English that a picture is worth a thousand words; well if you look here, you can just look on the page – where are your eyes drawn? To this guy, to this thing, to this red hair over here, maybe even to this little graphic down here and then you go to the bold text. Maybe you go to the $2 first then you go to the bold text, then you go to the bold text, then you go to the blue text. The image is the most powerful thing on the page. A video is even a moving image and is even more powerful than that. But I thought I would show you actual traffic statistics from my Strive4Impact site. We get some decent traffic on this site. If we look at the top traffic sources here, you can see that the number 3 source of traffic is actually Google Images. A Google Image search during the time period we’re looking at is the 3rd most brought-in source of traffic. So what I’m going to do is … well, a couple of things: number one, I’m going to make a proclamation in this video, I’m working with a friend to try and get their website ranked in the Top 10 for a certain keyword phrase so I’m going to talk about that at the end of the video and proclaim something just as a goal and something that I’m working on. But first I want to talk to you about what we do to actually get the images to rank well in the actual page code. And again, as with all things code that I talk to you about, you don’t have to know how to do this yourself, but you have to know how to look at it to see if the person who you’re hiring to do it for you is doing it correctly. We are just going to go and grab … I’m going to talk to you about ice cream in just a minute, but here’s an image on NBC.com about ice cream and I’m going to copy this image location. If we go up to the address bar actually, you can see its NBC.gov/news/news_summer-blah-blah-blah/Denver_ice_cream. I’m going to copy this – the thing that the image is actually called is Denver_ice_cream. That’s really important! They’ve keyworded their actual image name. I’m going to show you the code here; how we do this to make the code actually in a way that Google can find out what the image is about. You don’t want to do “spammy” but you want to describe what the image is about; “This is the best Denver Ice Cream.” I would not go any longer than that in your alt text. But that’s what’s going to show up when you actually roll-over the image. So if you are on a page and you roll-over something and you get that little box that pops up, this is what you would see is this alt text. I’m going to show you this when we actually put it up on a page. So that’s another way to optimize that image. So now what you would do is take that alt text and put it inside of here and you have img src=this and the alt is this. The one thing you want to make sure you do, because it helps your pages load quicker and it also says that you’re taking time to actually care about the user experience, is to set a width and a height for all of your images; width=250, height=200. Now that might not be exact but good enough for now. Then you want to add text around your image that actually shows what the image is about. This is just inserting a page break in between the image and what text I’m going to use; “You can get Denver’s best ice cream by attending one of our ice cream giveaways.” Let’s just say that that was the text I put around the image. Let’s take all of this code and I’ve put it into a Notepad document here so I can save it as a HTML file. You don’t have to know how to do all of “this” stuff, but in WordPress, make sure that your images have alternate text; make sure the words around your image represent what the image is – the actual file name of the image represents what it is as well. I always use dashes (-) instead of underscores (_); so if I was really going to do this right, I would change these underscores to dashes. I would save the file as something new and I would change these underscores to dashes because dashes, according to Google, dashes are better than underscores. But I’m going to go ahead and save this as an HTML file and upload it and I don’t know if you know you can do this, but in Notepad that you can just save it as “All Files” and save it as an HTML. I’m going to save the page as denver-ice-cream and I’ll go ahead and click Save. The only other thing I’m going to add into this code is I’ll put a page break in there and then I said, “Find out more about great Denver ice cream.” And the title description that actually defines that link is “Denver ice cream” and then the text is “Denver ice cream” so it will be a link back into their store that actually says that their website is about Denver ice cream. What I’m going to do is go ahead and save this page and we’re going to upload that page that I just made, that Denver Ice Cream page, we’re going to upload it to Three Money Methods. So now if I go over here and I go www.ThreeMoneyMethods.com but then I’m going to go to Denver.html and then we go! So now I have “Denver Ice Cream giveaway” and this is in bold up top. If I roll-over the image, I get that image text showing up; now you can’t see it because it doesn’t capture on the video here, but one way to actually be able to see it is by going into the Properties, you can see the alternate text says, “This is the best Denver ice cream, 2009 Free Ice Cream Giveaway in Denver. Fans love our Denver ice cream giveaways. You can get Denver’s best ice cream by attending one of our ice cream giveaways.” Now that sounds a little spammy, you might not want to be that spammy – “Great Denver Ice Cream.” If you click on this, there’s the rollover showing up; it doesn’t show up on the image for you guys, I don’t know why. But if you roll-over this and click on it, then you will actually go to the Red Trolley which is my friend’s ice cream store here in Denver. Wish us much success for that! I will do a report back here on Three Money Methods to see before the end of 2009. I will definitely be making another video to show you how that shaped up for them. Alt text for your images. Text around your images is very important. Make sure the text around your images is describing what the images are. The name of the file is very important. Use keywords that are separated not by underscores but by dashes. Also use Title Text to describe the image. Don’t overlook image search, it’s very important; it can help you get more traffic coming to your website just by doing something small on a regular basis helps people to know what things are on your website. Definitely look forward to seeing you back here for another edition of Three Money Methods Traffic Tuesdays. We’re going to be covering some awesome topics in our next video. Look forward to seeing you back here next week!